“It’s simple child. 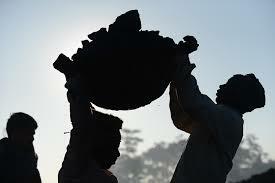 You go there, pick up some coal, return & we pay you five rupees every day” said the stout middle-man, Vishnu beamingly. “So, children pick up your shovels & get to business we’ve enough work at hand” added Vishnu as he looked towards the line of eager children. “I guess five is enough. This way I’ll help mother” as he was engrossed contemplating how he’d inform his mother that he finally intended to leave school for this menial job, a sharp voice pierced him “Pick up the shovel daydreamer!” This was his school buddy Bikram, laughing as he disappeared in to the dingy mine. Ajit finally ran towards Bikram & patted him affectionately. All these years they grew together; ran through the rickety lanes of his village, haggled with the hawker over sweet-meat, fought over the best rag they could wear to school, danced in the first monsoon rain; smelling the mud. Ajit’s father was a local peasant who worked on the field of zamindar sahib. As the naxal menace spread like a wild fire across the lands of Bihar many villagers deserted zamindar sahib’s land; they chose dignity over eternal shame, indigence over suffering & freedom over eternal servitude. The ground was ripe for a mass insurrection in the countryside. Taking cues from their peers in neighboring Bengal, disparate bands of Adivasi militias were beginning to coalesce. As they grew both in numbers & popular support the writ of zamindars that until now ran uncontested was in serious jeopardy. Obsequious & submissive, these were the same people who for centuries had toiled on the fields of rich land owning castes. The victims of one of the most humiliating socially sanctioned subjugation schemes in garb of religion & social hierarchy, they increasingly saw a source of retribution in form of an ‘armed uprising’ to right this grievous wrong. Through the summers of 1968 hundreds of disillusioned Adivasi youth would join the rank & files of fledging naxal militias across the land. The loudspeakers blared asking villagers to forsake this slavery. “Let it be known to all, the people of this land have risen against subjugation, that we shall take back what is rightfully ours. The fiats of zamindars shall be struck down forthwith & tyranny shall be answered by bayonets and you the people of this village bear a moral obligation of joining your comrades in this war for our people, our land & our honor.” thundered the bellicose Maoist leader: a veteran of Telengana revolt of 1948. As he finished an eerie calm swept the crowd that gathered to hear him & his lieutenants. Soon a motley of villagers form the lowly peasants to disaffected youth would enlist themselves for the naxal cause. One among them was Ajit’s father, a small time peasant: having lost his monsoon crop to drought; his sixth in last eight years & defaulting on the moneylender’s loan there was nothing to lose but, everything to gain. It has been full one year since his father left home. Often, Ajit’s overcome by bouts of fiendish nightmares: men clad in green barging into his home, dragging out his mother & sister towards the raised platform of the sacred pepal , proscribing them as naxals & finally shooting them point blank as they beseech them for mercy. Each bout of such a nightmare would leave him sweating & panting profusely. He’d then doubly check his mother & ten year old sister just to reassure him that he wasn’t losing them this way. “Why’d father do this to us? How could he disown us this way?” Little to eat & scant to cover them with, fate could hardly be more callous. He had often heard elders say “time heals all”. As days turned into weeks & weeks into months & as this monsoon gave way to the next, the pain of having a father who chose to desert them to bring about a ‘revolution’ slowly subsided. There goes the scoundrel! The one whose father deserted him! Surely, his mother must be an immoral coquette. Enraged, he’d often wallop boys at his school who hurled such imprecations at him. Slowly, even this fit of rage softened. No more would he hit them, no more would he bounce back with his own salvo of invectives rather he’d quicken his pace & cut through the next alley to avoid any further confrontation. It’s been a routine since past one year: Bikram would often drop at his home each evening, sometimes for homework & at other times simply to prate. His infectious cheerfulness & a bagful of gossip; from secret liaisons to the nugatory reason behind zamindar’s straying buffalos, he had everything ready. Lately, his prattle was the only thing that would bring smile to lugubrious faces at Ajit’s home. This time it was altogether different: Bikram had come to help his pal, as they finally planned to let the cat out by telling their families that they had dropped from school & were working in a coal mine for past one month. As Ajit swung the door open he knew it was a tough nut getting his way; over the past year his mother grew obdurate, never allowing him or his sister to venture out beyond the dusk, always quick to remind them; “Only until dusk else I’ll welcome you both with this cane.” At times he felt “maybe the nightmares are actually contagious, even mother is possessed by them & that’s why she won’t allow us out till late.” This time he prayed she would understand he only wished to shoulder her responsibility, that he wasn’t a coward like his father. Bikram jumped in beamingly, “So, how’s everyone?” Walking in slowly he exchanged a glance with Ajit. This meant only one thing: Bikram had his way at his home & now it was Ajit’s turn. Busy with her chores, Ajit’s mother blurted “You both ought to be preparing for your exams, killing your time in fields surely won’t help.”Bikram fell silent as if there was no any chance they could broach their new found ‘job’. But, Ajit knew, it was now or never; he won’t let his resolve dissipate so easily “not this time”. “What’s it Ajit?” Asked his mother stolidly, if it was to be yet another fatuous demand for some fancy toy, she was ready with a barrage of admonishments & this time the ever- grinning Bikram surely won’t be spared either. In a fit of pique, mother slaps him. All these years & above all odds she had always ensured that her kids won’t turn into some petty urchins like the hundreds of children in the village, stuck in the vicious cycle of penury & bereft of a future of their own. She’d work for extra hours in the fields; preparing the fallow, clearing all those bushes on the far side of the field & sometimes even working as an adjunct maid at the zamindar’s home. Between all these she had always prayed that she’d save enough to send both of her children to school hoping someday they’d break free of this fiendish life at this naxal infested village & someday things would change for better. How could then she bear the sight of her child slipping into the same abyss where she lost her husband? As Bikram slipped out through the wooden door with quickened steps Ajit knew he was left to fend for himself. Ajit had never seen his mother so weak even when his father deserted them, mother was impassive & firm. She’d always say “I’ve these kids to look after. I’ve no time to cry for what’s gone.” Broken, shattered & pleading tremulously today, this wasn’t the mother he knew all his life. Ajit wished he had never chosen to leave school. As the dusk laid bear beneath the usual monsoon clouds, Vishnu settled to complete some final task of daily accounting; 157kgs of coal removed, 1500 paid in wages to workers & 300 for transportation. The more diligently he reviewed his daily expenditure the more he realized; profits were fast plummeting & if he didn’t divest himself of this risky business he’d soon be either bankrupt or shot by the naxals whose demands for levies were increasing every month. “Sahib, the Commander has come” informed his assistant Prabhakar in a hushed voice knowing well his master won’t be pleased at the sight of the naxal leader. “I take you for your word Vishnu. The money must arrive tomorrow evening else my men know how to settle you & your business.” The Commander left with this warning as his guards flung the door open. As Vishnu saw the Commander & his men disappear in the dark, he realized his helplessness; it was all in vain. Even if he were to arrange for loans through the rich moneylenders of village he won’t have enough to pay the Commander. Banging his fist on the wall, “Prabhakar, ready everything we’re leaving tonight for the town.” He knew this was his best bet, if he were to escape in the cover of dark it’d be too late before the naxals would suspect any foul play. By the time they’d set their hounds in pursuit he’d be safely in the town. “You won’t get a single penny from me Commander…not a single coin” promised Vishnu to himself as he began emptying all his drawers & safes. “Mother, I’ll try convincing Vishnu. He’s a good man, he’d surely understand & allow me to leave” as Ajit tried placating his mother he knew deep inside none could be trusted here & certainly not Vishnu the man who deceptively goaded him & many other children into this sordid business. As Ajit & Bikram walked into the mining zone they saw chaos spread everywhere. Workers were squabbling over coal. A fracas near the far side of mine turned into a full blown brawl between two groups. Ajit soon realized why everything was in welter, “It’s all yours people, take what you can. We’ve liberated you & your children from Vishnu’s tyranny. No exploitation, no slavery & no master. Henceforth, you’re the rulers of your destiny.” It was the dreaded Commander & his abominable death squad known across the land for dispensing people’s justice. As the Commander continued with his homily, two armed naxals threw Vishnu amid a rancorous mob baying for his blood. “This coal digger thought he’d get away with his lucre. It’s you who deserve everything; it’s your sweat & blood. Take back what’s rightfully yours.” With his signal, the crowd began hurling stones at Vishnu & soon he lay lifeless in a thick pool of blood. The crowd roared & cheered in frenzy, Ajit was ambivalent he knew with Vishnu gone he was free but, deep down he felt there was something amoral & dastardly unfolding here,“ Bikram, it isn’t safe here. Let’s go home.” Bikram nodded. Dozens of green trucks rushed towards the mining zone & hundreds of security forces & counter insurgency militias began pouring in through the northern side of the precinct. Naxals & many villagers were caught off guard. What followed was indiscriminate butchery, not a soul escaped including Ajit & Bikram. Every day she’d drop her daughter to municipal school without fail as she went to attend her work as a maid. These two years took a toll on her health; emaciated & a husk of her earlier self her daughter was the only thing that kept her going. In the bustling city of Calcutta there was always something to distract her; the elegant bazaar, motley of hawkers selling sweetmeat & an assortment of other delicacies. Here she’d often forget her past; a husband who abandoned her, the killing of her son & her subsequent flight from the village as security forces went on a rampage. Sometimes, these tantrums would get on her nerves but, often she’d bear them affectionately for her daughter was now her world. Previous Post What’s In The Identity?